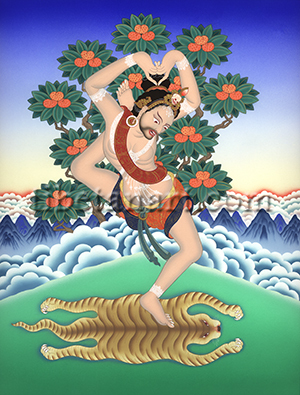 Jalandhara, meaning the ‘net-bearer’, is listed is the forty-sixth of the Eighty-four Indian Buddhist Mahasiddhas, and appears here standing upon one leg upon a tiger-skin in a specific yogic-posture know as jalandhara-asana. His legend relates how, disgusted with cyclic existence Janandhara retired to a charnel ground, where entering a state of blissful awareness he received the blessing of an enlightened dakini. After supplication this dakini through many fervent prayers, she eventually manifested before him and bestowed the initiation of the Hevajra Tantra upon him. She instructed him to concentrate all aspects of his body, speech and mind into the three psychic channels, then to empty all the mental concepts through his solar and lunar channels into the central channel, and then eject all these constructs into space through the central channel’s ‘gate of purity’ at the crown of his head. After seven years of meditating on the ‘completion stage’ of the Hevajra practice he ultimately attained mahamudra-siddhi. Janandhara’s name relates to one of the four most sacred geographical sites or pithas of ancient India, which are identified as Oddiyana, Purnagiri, Kamarupa, and Jalandhara in the Hevajra and many other tantric systems. Jalandhara was originally situated near the sacred site of Jawalamukhi in the Kangra Valley area of north-west India, with the modern Indian city of Jullunder being named after this Hindu tantric pitha or sacred-site.